Whether a business needs a full renovation or a small surface repair, one of the most common jobs that businesses turn to is commercial sandblasting. At AW Painting & General Contractors, we offer complete commercial sandblasting services in the Greater Philadelphia area. This necessary step is crucial for surface remodeling or repair, no matter the scale. With attentive and experienced general contractors, quality control and safety is an integral part to how we work every day. No matter where your business is located in the areas of Philadelphia, Southern New Jersey, Delaware, or Lehigh Valley, our professionals can complete your job, whether it’s extensive or small-scale. With our professional sandblasting services, we can help clean the outside of your building due to grime and pollution. Or if your equipment or machinery needs rust removal, we can help with that as well. Surface preparation is one of the earliest steps in repairing and remodeling the very foundation of any commercial property: the walls. For any commercial or large scale painting work, sandblasting may be necessary in order to ensure the highest lasting quality based on the paint brand’s recommendations. For older commercial buildings, safely removing older paint coatings is a must. A new paint job cannot be completed without getting rid of corrosion first, followed by a sandblast cleaning on the surface. AW Painting and General Contractors are equipped to handle your maintenance repairs. Our team is experienced in using sandblasting equipment for needed aspects of your project. Not every commercial property is ready for business on day one. Whether your commercial property needs maintenance assistance or sandblasting, power washing, or painting, AW Painting and General Contractors has experienced contractors that can do it all. 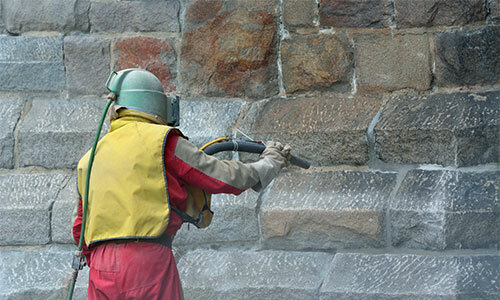 Commercial sandblasting is necessary but should only be performed by licensed contractors who are equipped with the right tools and techniques. We will work closely with you through each phase of the remodel, so we can better understand what you would like the finished product to look like. This is crucial to deliver an interior that portrays your type of business. AW Painting and General Contractors specialize in all aspects of commercial property maintenance and repair. Our Philadelphia sandblasting contractors have experience working in commercial properties located throughout Philadelphia, Southern New Jersey, Delaware and Lehigh Valley. Your building relies on a polished and professional presence both inside and out. Get in touch with us to see how AW Painting and General Contractors can repair your property with our commercial sandblasting services serving Greater Philadelphia businesses for over 40 years! Don’t wait – call us today!